Newly appointed Baltimore City Democratic Sen. Nathaniel Oaks (D 41) has sponsored a voter identification bill (see the text below). Such legislation is normally presented by Republicans in order to disfranchise Democrats, especially minorities, in the guise of combating the boogeyman of voter fraud. In the House of Delegates, the same legislation has been cross-filed by Del. Neil Parrott of transgender paranoia fame and cosponsored by thirteen other Republicans. No Democrat has cosponsored the House legislation and no one has cosponsored Oaks’ bill. Study after study has shown voter fraud is virtually non-existent. As Colombia University Prof. Lorraine Minnite put it, “The claim that voter fraud threatens the integrity of American elections is itself a fraud.” It’s appalling that Oaks is fighting to suppress the right to vote instead of to protect and to expand it. UPDATE: I am told that Oaks did this by “mistake.” He asked for all of his House bills to be cross-filed and there was an error with the number. How this happened and why he never noticed or withdrew the bill, I don’t know. Sources say he plans to withdraw the bill but it’s still on the website, though languishing in the Rules Committee. Ex-Felons and Members of the Community Demand the Immediate Removal of Sr. Director, Armistead Jones. Baltimore, Md. – Communities United chapter of Ex-Felons are holding a press conference and rally to call for the immediate dismissal of Sr. Director, Armistead Jones. Under the leadership of Mr. Armistead Jones, the Baltimore City Board of Elections has made a mockery of the voting process, which can be viewed as voter suppression. Numerous errors have occurred under the leadership of Mr. Jones; enough for him to be called before a special hearing in the Maryland Senate to explain the debacle of the most recent Primary Election. Even at that time, Sr. Director Jones has repeatedly failed the members of his staff, while never taking any personal accountability or ownership of the failings in his role as Sr. Director of the Baltimore Office of the Board of Elections. Mr. Jones’ position of leadership requires that personal accountability for the proper execution of all tasks be solely his. Perry Hopkins, a Field Organizer for Communities United and Ex-Felon states, “Voting is the bedrock of our democracy and as such, we must have absolute faith in the process and be able to rely on those entrusted to handle our votes, accurately count our votes and accurately report the results in an orderly and timely manner.” As a direct result of mismanagement by the current leadership of Sr. Director, Armistead Jones, this was clearly not the case across Baltimore City in the last and most recent Primary Election cycle. “I think it’s a personal matter of how he feels. He doesn’t want to look at the Ex-Felons who want to vote, because he’s not concerned about our rights,” says Reginald Smith. 1. Several polls did not open or close on time, thereby suppressing the vote, as voters were turned away. 2. Unlawful letters were sent to numerous newly enfranchised Ex-Felon Voters, discouraging them to register to vote, which is an act of voter suppression. 3. There were not sufficient numbers of functionally trained judges to service voters at polling sites. 4. Of his own volition, the Sr. Director certified election results before all votes were accurately counted. 5. Votes and voting ballots were improperly handled and miscounted. Provisional ballots were scanned, over 1000 more votes were erroneously cast than were checked in, and boxes of ballots were missing only to be found at a later date. 6. His current actions have now breached the public trust in the proper and accurate execution of the voting process and his continued tenure also serves as an act of voter suppression. 7. Reasons supporting the termination of Mr. Jones’ tenure clearly outweigh reasons to retain him, as indicated by his recent performance in the service of Baltimore City Voters. The Maryland Senate special ordered (i.e. postponed) the vote on the Governor’s veto of the bill to restore the voting rights of ex-felons to a later date. The House overrode the Governor’s veto yesterday. The lead sponsors are Sen. Joan Carter Conway and Del. Cory McCray. The Senate President stated forthrightly on the floor that this was to allow time for the appointment of a replacement to former Sen. Karen Montgomery (D-14). Rumor has it that many General Assembly Democrats are not thrilled about the timing or handling of this appointment. The Maryland Senate took a major step toward keeping Marriott headquarters in Maryland by overriding the Governor’s veto of a bill that requires the same tax rate levied on hotel rooms sold by third-party hotel bookers as by the hotels themselves. This seemingly obvious fairness–the major request of the Marriott Corporation whose headquarters Montgomery County is working hard to retain–had the Governor cowering in fear that it might be cast as a tax increase. It’s evidence that the Governor’s ideological passion exceeds his desire to keep major companies in Maryland. 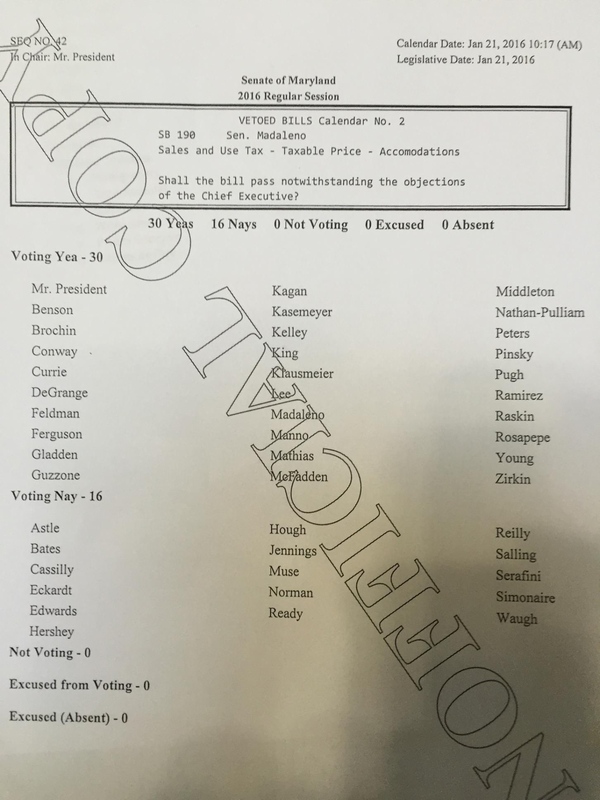 As the tally sheet shows, the Senate achieved the 29 votes required to override a veto with one to spare despite Sen. Montgomery’s retirement. A real victory for Senate Budget and Taxation Vice Chair Rich Madaleno who pushed hard for the bill. Two vote switchers from the original bill are Sen. Addie Eckardt (R-Eastern Shore) and Sen. John Astle (D-Anne Arundel). Eckardt’s switch was not surprising, as Republicans tend to want to rally around the Governor to support a veto. In contrast, Astle is a member of the Democratic leadership team, so his vote to support the Governor was a shock. Indeed, this Montgomery blogger wonders if Montgomery Senate Democrats might return the favor by voting to uphold the veto on funding for Anne Arundel–except that the Speaker wants it. UPDATE: Sen. C. Anthony Muse also flipped, which is interesting since Gaylord Marriott, located at National Harbor in his district, in Prince George’s made it a top priority. Additionally. Sens. DeGrange and Peters–both Democrats–switched from red on the original bill to voting to green on this vote. A Great Way to Honor Dr. Martin Luther King, Jr. Audio Recording of Dr. Martin Luther King, Jr.’s “Give Us the Ballot” Address at the Prayer Pilgrimage for Freedom. Dr. Martin Luther King, Jr. was an indefatigable fighter for voting rights. A great way to honor his legacy would be for the General Assembly to overturn Gov. Larry Hogan’s veto of a bill that would restore voting rights to ex-felons. The bill would restore the voting rights of 40,000 people. Its lead sponsors are Del. Cory McCray in the House and Sen. Joan Carter Conway in the Senate. The House of Delegates website says that it adopted a motion by Del. Anne Kaiser to special order the bill for an override vote on January 20th. Turning this bill into law would be a great start to the legislative session. The bill would remove the obstacles that are in the way of an estimated 40,000 ex-offenders in Maryland who want to vote. Current law in Maryland prohibits individuals with a felony conviction from voting until after they have finished parole, probation and paid restitution. Advocates say many of the former felons who are eligible to vote are uncertain of their voting status. They fear of being accused of voter fraud and being arrested again. [Sen. Joan Carter] Conway described the current law as a form a voter suppression. The General Assembly should pass this legislation for a variety of reasons. First, we should make it easier for people who have the legal right to vote to participate–not placing barriers in their path, including fear of running afoul of the law. Some may not like that former criminals get to vote. But we are all citizens of this country. Once someone has paid their debt to society, their citizenship rights, including rights, should be restored as part of their return to the community. Moreover, the criminal justice system does not always treat similar offenses in the same way. As a result, some people who commit become classified as ex-felons while others do not. There is no reason for this disparity in sentencing–a whole different area for debate–to carry over into the restoration of voting rights. Studies show that education is the best predictor of the likelihood to vote. Additionally, people who are more likely to vote include older voters, married voters, and people with a long-established residence. As a group, former felons are far less likely than other Americans to possess these characteristics. Difficulties in obtaining a job exacerbate problems in gaining a stable housing situation. Barring some very serious organization, former felons will remain much less likely to register or to cast a ballot. So Republicans who fear that this is a plot by Democrats to get more of “their” voters on the rolls should chill. The impact will likely be small. More importantly, even if every single one voted, no political party worthy of the name should be afraid of citizens participating in our democratic process.